A greener house is more relevent than ever. UK Grants are now offered on upgrades to a renewable heat sources. You could even be eligible for financial support towards solar thermal hot water systems, heat pumps and biomass boilers. When it comes to the environment there are several things to consider when moving house. Often this is the time to plan ahead and make sure your new property will prove to be kinder to the environment. Your home actually becomes far more efficient using green or recycled materials. Take advantage of your lot and position your home to make the best of natural lighting. Consider recycled paper or denim products to insulate your home. Choose countertops made of recycled glass instead of purchasing a granite countertop. Install high quality thermal windows cutting down on heating and cooling bills. Consider a geothermal heating and cooling system. Incorporate solar panels. Choose and install Energy Star rated appliances. All of these things help eliminate waste and reduce energy consumption land fill sites and more importantly your out goings. Say goodbye to radiators as you go for the ever popular underfloor heating, as well as looking good it also increases comfort and room space in difficult areas like bathrooms. Underfloor heating transfers its heat through warming everything standing on it, and therefore warming the room from the floor up, of course heat rises so it makes perfect sense and is cost effective. Previousl heating systems rely on convection or radiation, which typically warm the upper spaces first, and requiring more energy expenditure. Green power and sustainable energy sources are pointless unless the property is adequately insulated. There are a variety of products that are very efficient at insulating both lofts and cavity walls, but an increasingly popular eco method is to use sheep wool. This material contains no nasty chemicals, can rapidly absorb and release water vapour, and thus help to keep buildings comfortably temperate all year round. Almost every material used in the home has its greener alternative. Organisations like the Forest Stewardship Council are able to give guidance on sourcing flooring and timber from sustainable sources. There are also abundant suppliers of organic/eco-paints, lime plasters and earth/clay products. These not only benefit the environment, but can often help alleviate allergy symptoms. Most new loos will provide long or short flush options. You can even buy little box-like gadgets that sit in the cistern of older loos and help save water. But you can go further. As every gardener knows, harvesting rainwater is a good way of beating the hosepipe ban every summer, but collected rainwater and recycled grey water can also be re-tasked to flush your loo or run your washing machine. Composting toilets, meanwhile, can provide surprisingly sweet smelling nutrients for your garden as well as relieving the burden on our overworked sewage system. If you are developing a property to let, why not assist your tenants in their eco habits by supplying energy saver light bulbs, energy efficient white and brown goods and – most important of all – providing designated space for sorting and storing recyclables. Even the most conscientious recyclers can find it difficult tidily storing old newspapers, cans, bottles etc between collections, so having designated space for this would be a tremendous boon. If you are going to extend or reconfigure living space look into sourcing recycled materials like bricks, insulation, etc. Likewise sourcing interesting fireplaces etc from salvage yards cuts down on waste while at the same time investing the property with character. If you need to replace guttering meanwhile, why not consider copper? Copper is durable, doesn’t crack, and moss and lichens cannot grown on it. What better place to begin than buying your property with a green mortgage? 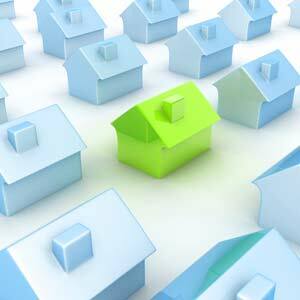 Consult your Independent Financial Advisor on the range of green mortgage products currently available. One lender currently attempts to offset a fifth of the carbon emissions arising from the homes it mortgages through a process of reforestation in African national parks. Other providers offer their mortgages under the condition that the home to be mortgaged fulfils strict energy efficiency standards. Of course, whoever buys your house will be free to chop and change energy suppliers as they see fit, but during the refurbishment phase, why not sign up to a supplier of greener electricity? Most will also be able to offer useful advice in heating and insulating the property efficiently. And simply having your central heating boiler regularly serviced by a Corgi registered engineer will ensure it burns more efficiently and uses less fuel. Solar power can be an expensive option for generating household electricity, but again will cut bills significantly over the years. Solar hot water systems tend to be cheaper and more direct, and make a significant contribution to the efficiency of the house. Likewise, a residential wind turbine for an outlay of between £350-£450 could generate between 18-21% of the average home’s annual electricity requirement. So solar power is also becoming a popular choice at the moment. Increasing the amount of glass in a property can increase the passive solar gain, and therefore help to heat the home.Like a green house or a conservatory, the more glass the more heat can be contained from the sun even on a cloudy day. Of course good ventilation is also essential during the summer months. This mail helped me alot in my college assignement. Gratefulness you on your information.